International aviation has long been an integral part of International Relations (IR) as we know it, but it has sadly been understudied in the field. Recent developments since the early 2000s, including the fallout from the tragic accidents in Asia in 2014–15, are a major warning sign that the globalization of commercial air travel demands the commensurate study of the international politics of aviation. While our forthcoming article in the Cambridge Review of International Affairs (Volume 31, Issue 3/4) delves extensively into the 2014–15 cases of aviation tragedy, we would like to highlight two additional fronts that merit further investigation in the near future: climate change, and the increasing salience of the social elements of politics, intruding into the operation of airlines and airports that handle international flows. The impact of aviation on climate change has long been recognized. Air travel is a carbon-intensive form of transportation and the emissions from planes contribute to climate change. The International Air Transport Association (IATA) forecasts, moreover, that the number of air passengers will double to almost 8 billion by 2036. Nonetheless, steps are being taken to reduce the environmental impact of aviation, such as through the use of more efficient plane engines or other forms of carbon offsets. On the other hand, we are generally less familiar with how climate change can affect aviation. Indeed, greater political cooperation between countries is necessary to prepare the aviation industry to deal with climate change. Climate change’s effects on aviation include more mundane aspects such as higher surface temperatures altering the take-off performance of planes, especially in airports with shorter runways or at a higher elevation. The number of passengers and fuel loads are affected, with knock-on effects on range and traffic density. Are airports ready for disasters caused by climate change? Air travel could also take longer as climate change is causing the jet stream to strengthen at high altitudes. Even if the plane travels with the jet stream, this would likely be a more bumpy ride with increased air turbulence. The probability of high-altitude icing, which may cause engine failure, is also expected to increase with climate change intensifying thunderstorms. Air France flight 447, which crashed in 2009 flying from Rio de Janiero to Paris, was a result of such icing. Adverse weather conditions spurred by climate change, such as storms with increased intensity and frequency, also affect airport operations. Typhoon Mangkhut, which passed 100km south of Hong Kong in September 2018, caused an almost complete shutdown of Hong Kong Airport. Almost 100,000 travellers were affected. 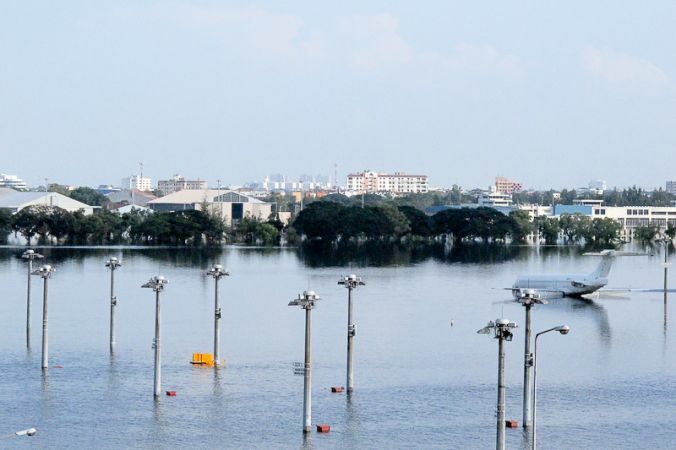 Climate change threatens the viability of airports at coastal locations as well, as sea levels rise. The busiest airports are typically found near major cities and close to a coast or river. Hong Kong Airport, for instance, is built on reclaimed land. When Typhoon Jebi hit Japan, also in September 2018, Osaka’s Kansai Airport was flooded, submerging several planes up to their engines and causing the cancellation of more than 700 flights. Worse, travellers were stranded when a nearby seagoing tanker, blown by the strong winds, crashed spectacularly into the bridge linking the airport – situated on an offshore artificial island – to the mainland. In fact, at the time of writing, Kansai, along with the far busier Japanese hubs at Tokyo-Narita and Tokyo-Haneda, have also declared fresh typhoon-related partial shutdowns and flight postponements. As weather conditions deteriorate, flights inevitably have to be diverted or cancelled altogether. However, are airports ready for disasters caused by climate change? Technically, airports do not have to be completely shut down by a disaster caused by climate change, such as flooding. But it can take as little as an increase in temperatures causing the tarmac on runways to melt, for example, for airport operations to be significantly affected. Runways in Canada have even been damaged by thawing permafrost. Damage caused by disasters can also take a period of time to repair. Bangkok’s Don Mueang Airport, for instance, was closed for four months due to floods brought on by heavy monsoon rains in 2012. In the case of Kansai Airport, an editorial in the Asahi Shimbun highlights the various inadequacies of airport operations in dealing with the aftermath of the floods and the loss of access due to the damaged bridge. According to the author, ‘Levees have been raised repeatedly at Kansai International Airport in response to land subsidence and flooding damage since the airport was opened in 1994’, but this did nothing to prevent the floods caused by Typhoon Jebi. The author draws further attention to the confusion in responsibilities when the facilities and runways of Kansai Airport are government-owned, but operated by a private-sector company. The solution is clearly to step up political cooperation between countries with regard to aviation, possibly along the lines of private-public partnerships. Given the fact that today nearly ‘everyone can fly’, to borrow a slogan from the fledgling budget airline Air Asia, every national society’s flaws and tumults are increasingly reflected in incidents aboard scheduled flights and at the departure gates at most airports. The Cho sisters’ shenanigans either onboard Korean Air flights (i.e. the infamous ‘nut rage’ incident) or in relation to the airline’s advertising campaigns, smeared their standing vis-à-vis Korea’s deeply Confucian society when Cho Yang-ho, the director of the Hanjin conglomerate that owns the airline, decided that damage control meant firing his two daughters from their executive positions in the company. Every day, immigration officials at major hub airports in the US, Britain, Australia, Germany, Israel, France, Singapore and China make the effort to ‘grill’ ethnically profiled visitors disembarking at their air terminals. The events of 9/11 gave such institutionalized interrogation a fillip. Now, the ‘scare’ of disguised Islamic fundamentalist terrorists infiltrating a country under the cover of tourism and asylum-seeking combines with the fear that foreigners on work permits, enjoying refugee status, and other long-term residency may be contributing to a ‘Jekyll and Hyde’ form of socioeconomic globalization. Foreign manpower is sorely needed to meet the demand for nannies, nurses, public cleaning agents, construction labourers and students to fill the coffers of many a cash-strapped university. Yet they are also seen as disrupters of neighbourhood aesthetics, as well as linguistic and secular nationalisms that held sway before the new arrivals. President Trump’s controversial travel ban on six Arab and North African states and the separation of children from the parents of undocumented immigrants in the USA will surely heighten airports’ salience as sluice gates for the aggressive filtration of ‘bad globalization’. At some point, the immigration checkpoints at airports will manifest a new travel apartheid reflecting and entrenching the divides between the West and Islam, and between the Global North and Global South. Air travel is, after all, the epitome of 'international' since passengers are being ferried through the skies across political jurisdictions in their pursuit of business, education, industry, diplomacy or tourism. The international politics of aviation should therefore be urgently studied as a legitimate dimension of global governance, or as a new front in the socially conscientious discipline of IR. Chang Jun Yan is an Associate Research Fellow with the Military Studies Programme at the S. Rajaratnam School of International Studies (RSIS), Nanyang Technological University, Singapore. Alan Chong is Associate Professor at the S. Rajaratnam School of International Studies.